In nature, gold nuggets are not pure gold. They are a combination of minerals, known as ore. The metal can be removed from the ore in a process known as smelting, in which the minerals are separated by melting point. Smelt gold is more pure than the original ore product, but can still contain impurities such as sliver, copper and platinum. A second refinement can be done by dissolving the smelt gold in a combination of acids; a method known as aqua regia refinement. 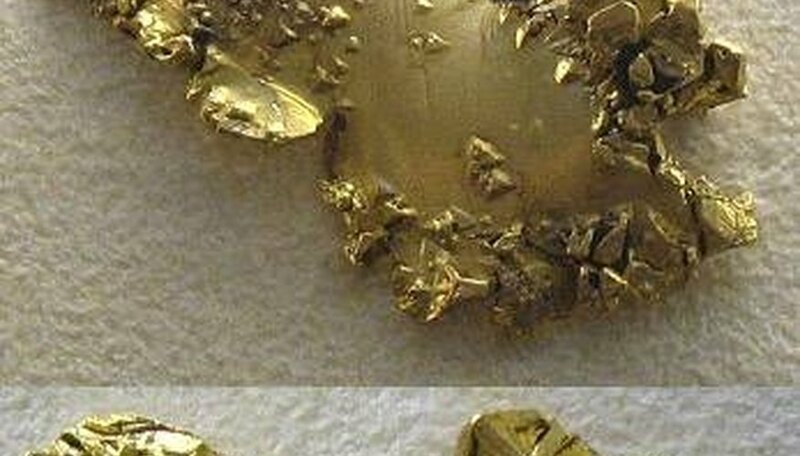 The result is gold that is 99.95 percent pure. Weigh your gold smelt. For every ounce of gold, you will need a container with a 300 milliliter capacity. So, if you're refining 5 ounces of gold, you will need a 1500 milliliter container, or about 1 ½ quarts. Add 30 milliliters of nitric acid for every ounce of gold. So, if you're refining 5 ounces of gold, you would need to add 150 milliliters to the container. Allow the gold to sit in the nitric acid for 30 to 45 minutes. Add 120 milliliters of hydrochloric acid for every ounce of gold in the container. For 5 ounces of gold that would be 600 milliliters of HCL. The addition of hydrochloric acid turns the mixture brown and can result in fumes. As the chemicals react and heat up, the gold will dissolve. Let the mixture sit for 1 to 8 hours to cool off. Line the funnel with filter paper and pour the acid through the filter and into another, larger container, stopping before any particles are poured off. The filtered acid should be green and clear. If the acid is cloudy, filter it again. Boil 1 quart of water. Remove from heat and add 1 pound of urea. Slowly add the urea mixture to the acid. This will cause an acid/base reaction, much like the old school volcano using baking soda and vinegar. The acid will foam up, so don't pour too quickly or you'll have a huge mess on your hands. When the mixture stops foaming, stop pouring urea in. All the nitric acid has been neutralized. Boil a second quart of water. Remove it from the heat and stir in Storm. For every ounce of gold, add 1 ounce of Storm precipitant. So, for 5 ounces of gold, add 5 ounces of Storm. (If using a different gold precipitant, follow the package directions). Slowly stir this solution into the acid. The solution will turn a muddy brown color and emit a strong odor. Wait 30 to 45 minutes. Check the acid for dissolved gold. To do this, take the end of the stirring rod and insert it into the acid. Remove the rod and touch it to a paper towel, creating a wet spot. Add one drop of gold detection liquid to the spot on the paper towel. If the spot turns dark, there is still gold in the acid. If you see this, give the Storm more time to work or add more precipitant to the acid. When the acid has separated into layers, with a clear amber top and a muddy brown bottom, pour off the top layer into another container. Be careful not to pour off any of the mud at the bottom as the mud is your gold. Add water to the mud when the acid has bee poured off. Stir vigorously and allow the mud to settle. Repeat, rinsing the mud with water 4 times. Rinse the mud with aqua ammonia. When the aqua ammonia is added, white vapors will form as the remaining acids are neutralized. Rinse the gold mud a final time using distilled water. When it settles, pour off the water and scrape the mud into a heat proof bowl. Place the bowl on a hot plate and allow it to dry. When the dry mud is melted and allowed to reform it will take on the appearance of metal and will be 99.95 percent pure. 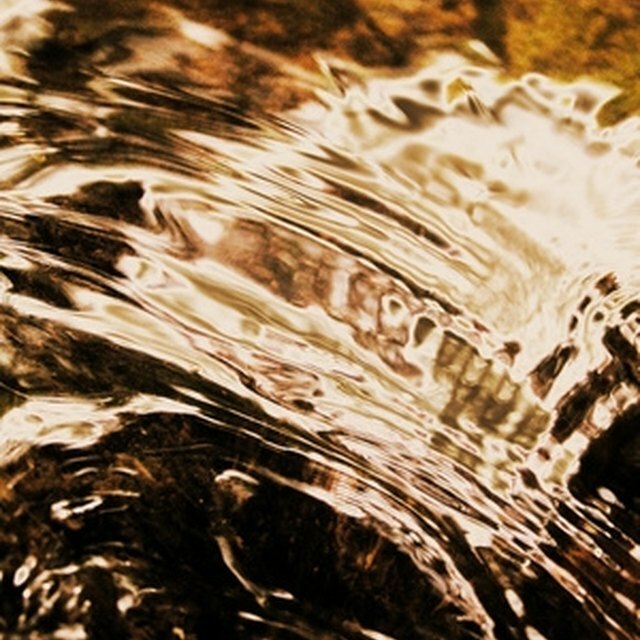 If there was platinum in your gold, it will not be dissolved by the acids and will be left behind in step 4. Always save your precipitants- you never know what you may get. This method uses strong acids which can be harmful if spilled on the skin or if ingested. They also generate fumes which can irritate the respiratory system. Work in a well ventilated area and use protective clothing. Neutralize any acid spills with a liberal application of baking soda. Parris, Lisa. "How to Refine a Gold Smelt." Sciencing, https://sciencing.com/refine-gold-smelt-4826998.html. 24 April 2017.